Northampton…and friends you have yet to meet! One of the most common questions we have been asked at our book-signing events is “now that the Pan-American trip is over, what’s next; where will your travels take you to next?” The answer to this question is that we are already embarked on our next journey with the book events themselves. We are going to places we never thought we’d be, meeting complete strangers and engaging in fascinating discourse allowing them some insight into our past and hopefully encouraging one or two along the way to maybe have a go themselves. So who are these ‘strangers’? The first Saturday on October took us to Waterstone’s in Northampton. I had a glorious ride up on the bike; nothing like 50 miles of twisty back-roads to set you up for any day! In town, pushed the bike up the pedestrian precinct in Abingdon Street and arrived outside the store just as store manager Emma opened the doors for the busy day ahead. I had no sooner set up stall when I was met by a beaming lady called June, named after the month of her birth. June had spent many years of her life riding pillion and loved everything about life on two wheels. She spoke sadly of the day when the family got their first car. She hated it and yearned for the open road on the back of a bike. June had spied Emma’s window display the day before and came in to town especially this morning to meet the author and get the book. One of the loveliest signings to date! And so began the steady trickle of business throughout the day. 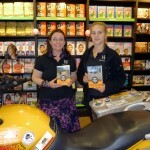 Meet and greet, pass round the bookmarks and engage in some pleasant discourse on the journey, the bike and the book. I acquired two of my youngest readers today following a charming chat with Tania and Amy, two sparkling teenage girls already plotting their gap-year escape with an enthusiasm unmatched since Columbus asked round the bar if anyone fancied seeing what’s over the water! At the end of the day, the icing on the cake… Whilst engaged in a chat around the bike with a fellow grey-beard, I noticed there was something wrong with my pitch as he seemed awfully familiar with the bike and the places we’d been and was especially adept at anticipating one or two of my anecdotes. The gentleman in question was a surgeon from Liverpool who had already read the first book, procured from Waterstone’s in Merseyside, a store we’ve had no contact with. This was our first indication of the books spreading without our active involvement; a fantastic piece of news! So I’ll ask again, who are these strangers? And I’ll answer it this time with the old adage that there are no strangers, only friends you’ve yet to meet!